At home, in my small village, in central part of Afghanistan, I used to carrying water in buckets on my shoulders from a stream which was 100 meters away from our house. Being born in a mountainous area with water scarcity I understand the value and importance of fresh water. Considering my lifestyle in Carlisle and my lifestyle back home there is much difference. I can not make a comparison between here and there but I choose to make a comparison of my water footprint in Carlisle and Turkey. 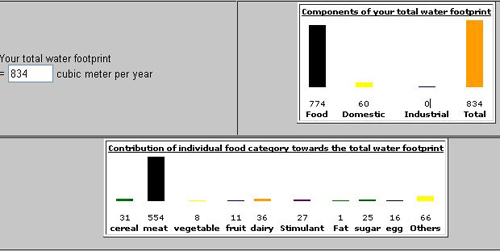 To find out my water usage I went to water footprint calculator on National Geographic, then on this link to use the extended water footprint calculator to assess my own unique water footprint and finally here to find out the water footprint of my country of interest. 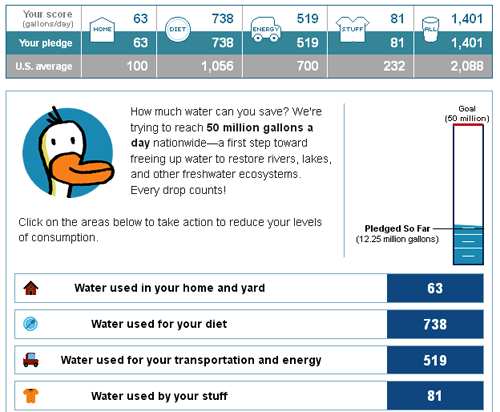 According to the following chart, my average water use falls 687 gallons below the U.S. national average. The chart shows that I purchase less stuff, electronics, clothes and other stuff than the average American. Based on this chart, my daily water usage is 16 gallons above the global average. Comparing to Turkey, I use 241 gallons a day less the average Turk.